ABOUT THE WEEKEND ENTERTAINMENT & EVENTS EDITION ~ Fridays, we post ideas for FREE (or really cheap) weekend entertainment for you and your family. Subscribe to our blog updates, and each Friday, you’ll receive this weekend guide along with more budget stretching ideas and tips throughout the week! Subscribe for FREE (here)! The Fort Worth Academy of Fine Arts performs The Littlest Wiseman, a pageant of the Nativity and presented as a Christmas gift to the community by the Dorothy Shaw Bell Choir. This gift to Fort Worth has been in production for over 50 years and is an annual tradition for many families. Tickets are FREE, but it is recommended that you make reservations in advance. When: Now through Sunday, December 15. Go here to view matinée and evening performance schedule. This weekend, NorthWood Church in Keller is hosting a fun community Christmas Festival for the entire family. The highlight of the festival will be the Story of Christmas hayride that will take you through 13 living scenes and panoramas, including a live nativity! Each night will also feature food trucks, bounce houses, a huge petting zoo, live music, games and so much more! When: Now through Monday, December 16 ~ 6:30-9:30PM. Cost: Admission is free and parking is $15 with proceeds from the Festival going to programs for kids with special needs. Savings tip: Advanced purchase parking passes are available for $10 online or at the information center on Sundays. Join the Central Library in Downtown Fort Worth for a wonderful afternoon full of Victorian style family activities and entertainment, including carriage and Molly the Trolly rides, the Dallas Puppet Theater, holiday music and even photos with a live reindeer. Christmas music will feature the Brass Works Quartet and the Dulcimer Players. It’s all FREE and open to the public. Celebrate the holidays Texas Pioneer Village style and enjoy the delightful sounds of Buttermilk Junction, an Old-Time & Anglo-Celtic band. You’ll feel like you’ve walked back in time, as you listen to historical tunes and songs from 1800s era frontier Texas. Families can also enjoy old-fashioned crafts and games including stringing popcorn and cranberries, making pomander balls, tamales, paper chains, embossed cards, ornaments, and more! Learn more here. Visit Santa at Sundance Square. The jolly old elf will be waiting to hear Christmas wishes at his home near the towering Sundance Square Christmas tree, adorned with thousands of lights, colorful balls and sparkling snowflakes. Kids can get their picture taken with Santa too! What: To learn more about visiting Santa at Sundance Square, click here. When: Go here for daily dates and times. When: Now through December 22, 2013 ~ go here for daily hours and click here for a schedule of special events during the week. Where: The event will be held on the Ballpark in Arlington grounds. The main entrance is at the Road to Six Flags and Ballpark Way. If you are planning to attend on December 15th, please see special note about parking here. The annual event, held on Main Street in Historic Downtown Grapevine, features Santa, jolly Christmas characters, hay rides, decorations adorning the mile-long stretch of Main Street, and much more! When: Friday, Saturday and Sunday until Christmas. Go here to view times for hay rides and kids games with Santa and his reindeer. 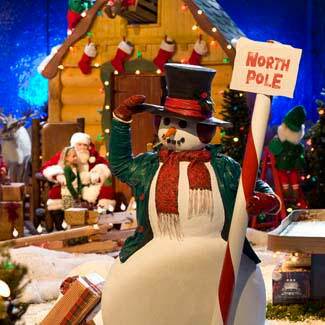 Bass Pro Shops is hosting fun daily events for kids at their Santa’s Wonderland. The festive events include FREE games and activities, FREE crafts and a FREE photo with Santa. Activities vary by day. What: To see the list of activities and events, click here. When: Daily, now through December 24. For schedule of photos with santa, craft activities, and game, click here. Is there a Christmas event you’d like to see on this list? Please submit your event and related details in the comments section. This entry was posted in Community Spotlight, Entertainment, Fort Worth, TX, FREE, Frugal Fun in Fort Worth (Cheap/Free Entertainment Ideas) and tagged Fort Worth Christmas, Fort Worth Events, FREE, FREE Fort Worth, Northwood Church. Bookmark the permalink.